You should not consider building this - half bridge circuits are more reliable than push pulls and primary coils are much less hassle than output transformers. Warning: projects described here use very high voltages and should only be attempted by experience constructors who understand the dangers. My first working circuit, indoor lightning - up to 6" of electrical arc - over 100,000 volts - a must have for every self respecting mad scientist. Also described at the end are modifications to give 14" of arc. 1) 250v mains to the transformer. 2) 140v DC which will also be present after the mains is switched off as the electrolytics take time to discharge. This voltage is high enough to be lethal. Fets have a very low leakage, so it is best to solder a 27k 17W resistor across the capacitors which will discharge them in a few minutes. 3) 1000v AC from the output transformer (enamel wire and a single layer of insulation tape is not a sufficient protection while the coil is running). The wire to the coil should be made with EHT cable and should not come into contact with any metal. 4) 100,000v from the coil - because of the high frequency, the power tends to run over the surface of the skin, burning rather than shocking. But RF burns are nasty enough. Never approach a running coil, switch it off before you try to make any adjustment. The coil will also induce currents in nearby metal so clear all metal from the vicinity of the coil before running. 5) The spark produces ozone, nitrates, and a little UV light. So open the windows, avoid long runs and staring at the spark for long periods. 6) Electrical interference to nearby appliances. In practice I found that my DVM and frequency counters could not be used while the coil was on but the tv, video and computer in the next room were unaffected. I now unplug my computer (including the modem cable), TV, video, hi-fi etc before operating any coils, due to the possibility of damage. The magnifier coil consists of about 1500 turns of 0.4mm enamelled copper wire close wound around a 4" PVC pipe. This pipe is commonly available in a builder's merchants. Drill another hole in the centre of one of the long faces of the wood and fit a 1" wood screw in this, as the spindle. Make a small hole in the end of each piece of wood for the screw nails and then screw the wooden pieces inside each end. Now mount a pair of 9" by 6" brackets onto a piece of wood so that the pipe can be placed freely between then remove the spindle screws and fit them through the brackets and into the cross piece. The pipe should now rotate freely and fairly evenly between the brackets. The mechanically inspired will want to add an electric motor, gears and a foot switch but it can be turned quite simply by hand. The toroid (or doughnut) on top of the coil provides some of the capacitance of the tuned circuit. It is formed using 2" by 36" pipe insulation, wrapped around a plywood disc and covered with aluminium foil tape. The transformer used is a 500w 50-0-50v toroidal. A 25A 400v rectifier is used because of the very high switch on currents as the capacitors are charged. A 4A slow blow fuse is used on the mains side. The DC fuse is place after the capacitors and is a 5A quick blow type. A 5A meter monitors the DC current. An inrush current limiter was used to reduce the switch on thump. This circuit needs improvement, in particular the PWM chip is unstable as I have not used current feedback into the ramp - see the data sheet for an explanation of this, it has worked reliably for almost a year now but it is very tempremental in particular the current limiting is precariously balanced between being oversensitive (giving zip) and under sensitive (zap). It is offered as an example for those interested in designing and experimenting with their own circuits not as an off the shelf construction project. The circuit is essentially a switching power supply, producing about 500watts of power at about 1500 volts at a frequency of 200kHz . At the heart of the circuit is a high speed PWM chip (pulse width modified). The frequency can be varied from about 150kHz to 220kHz. The width of the output pulse and thus the power can be altered from 0 to 90%. The pwm chip produces two identical alternating output pulses. These outputs are buffered by a pair of FET driver chips which switch the output FETs. 10ohm resistors and a pair of Schottky diodes damp any unwanted oscillations caused by the fast switching. The driver chip is the TC4422CPA this chip is capable of sourcing and sinking 9A, making it ideal for driving 3 FETs connected in parallel. (Drains and sources connected together, each gate has its own 10ohm resistor. Current limiting is provided by monitoring the voltage across the sense resistor, at 1V the output is switched off. This sense resistor must be a low inductance type - not a wire wound. FETs will switch on and off in about 30ns - the extremely fast switching of large currents coupled with the stray induction in the wiring and in the transformers would cause very high voltages pulses which are dealt with by the RC snubber network. Switching losses cause power loss in the FET and heating. At switch on the current rise is limited by the stray induction. At switch off, a second snubber circuit enables the capacitor C to conduct through diode D . This capacitor discharges through R . The FETs drive a step up transformer in push pull. Make sure that the outputs cause currents to flow in the primaries in the opposite sense. One end of the transformer secondary is connected to earth, the other end to the Tesla magnifying coil. There is something very strange about connecting only one wire between the circuit and the coil, the return path is provided by the capacitance between the top of the coil and earth. The output transformer is an ETD49, material 3C85. Primary is 11 turns of 2 * 1mm side by side, then on top repeat the primary winding twice, So that each primary consists of 3 * 1mm in \\. (2 identical primaries for push pull.) Secondary is a single 0.9mm wire. There is room on the bobbin for 3 layers giving a ratio of about 7.5 to 1. The higher ratio's give the bigger sparks even though, because of current limiting, you can only use about 50% of the cycle. This transformer is available from Farnell electronics UK. Power supply was a 240V : 50-0-50 V 500VA Toroidal transformer, 400v 25A bridge rectifier, smoothed with ten 300uF 385v caps. When first testing the circuit it is best to remove the high voltage fuse and check the operation at 12v only. If you have an oscilloscope examine the output from each of the buffer chips. It should be possible to modify the pulse width from 0 to 45% using VR1 and the frequency from 150kHz to 225 kHz using VR2. You can now calibrate the dials of these controls if you wish. If you don't have an oscilloscope then measure the voltage at each output. Most DMMs include an internal capacitor to smooth out the high frequency and give an average value which should vary from about 0 to 5V. When you are satisfied that the control electronics are working then set the pulse width to zero, switch off, insert the fuse, place a large resistor in the high voltage path, i.e. a 100watt light bulb, switch on. Check that everything is working as it should, increase the pulse width, and adjust the frequency. If you put 2 Led (connected in opposite polarities) between the output of the transformer and the coil you should be able to tune for resonance at the point where the leds glow brightest. If you are satisfied that everything is working remove the resistor and the Leds, put a wire onto the toroid - protruding a couple inches over the side, very slowly increase the pulse width until you see the current meter begin to rise. Now adjust the frequency. You should see a purple spark at the discharge electrode. Adjust the tuning to maximise this and continue to increase the power until you are at maximum current. Maximum current is 3.2A to keep within the transformers rating. In practice though I found that long runs at 5A didn't even warm the transformer. You now have your own indoor lightning. You can also demonstrate the wireless emission of electrical power by bringing a fluorescent tube up to the coil - it should begin to glow at about 3 feet from the coil. What about trying different designs of coil, different sizes of toroids? Lots of experiments that you can try. I must go now - Igor's just brought in something interesting! A larger coil was wound around a 5 litre polythene bucket sold in Boots for home brewing. Starting 1cm from the bottom and finishing 1cm from the top the bucket was close wound with 0.4mm wire. A larger toroid was then constructed. The new coil has a lower impedance than the old one so the circuit was modified to be driven by an interrupter - giving larger peak currents in short bursts. This gave a 14 inch arc from the toroid. The resonance frequency was now around 100kHz, Rt was increased and a larger output transformer was constructed. This new coil gave off a 14" arc. 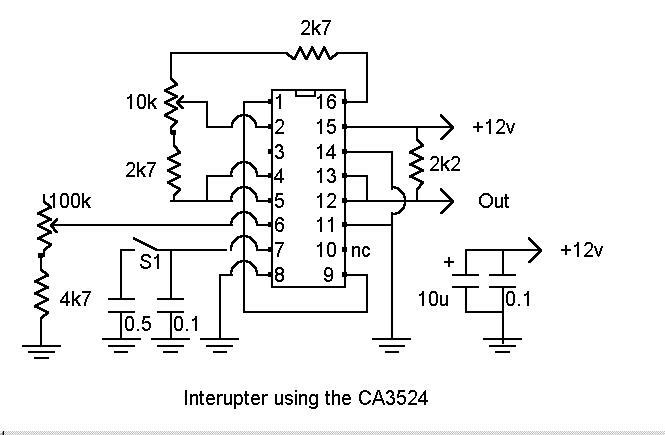 The interrupter is built around the CA3524 and is based on a design in the Harris data sheet. With S1 open the timing capacitor is 0.1uf giving a frequency of 140Hz to 2000Hz. With S1 closed the timing capacitor is 0.6uf giving a frequency of 25Hz to 500Hz. The mark space ratio of the circuit can be altered from 0 to 90% using the 10k pot. The output is taken via a diode and a 1k resistor to pin 1 of the 3825.